Mrs. Stewart S. Foster Route 2, Box 69 Hamburg, Iowa Helena Ark. 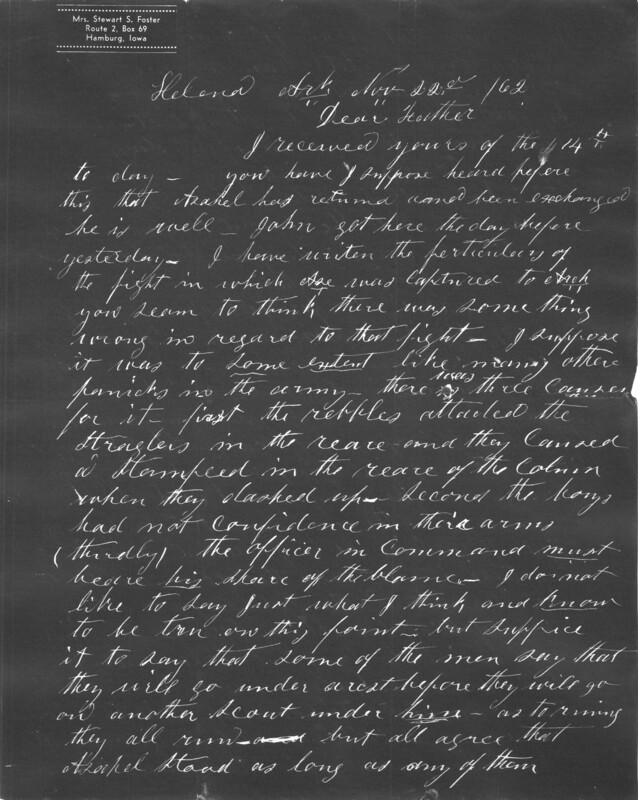 Nov. 22d /62 Dear Father I received yours of the 14th today - you have I suppose heard before this that Asahel has returnd and been exchanged he is well - John got here the day before yesrterday - I have writen the perticulars of the fight in which Ase was Captured to Arch. you seam to think there was some thing wrong in regard to that fight - I suppose it was to some extent like many other panicks in the army - there was three Causes for it - first the rebbles attacted the straglers in the rear - and they Caused a stampeed in the reare of the Colum when they dashed up - second the boys had not Confidence in their arms (thirdly) the officer in Command must beare his share of the blame. - I do not like to say just what I think and know to be true on this point - but suffice it to say tha some of the men say that they will go under arest before they will go on another scout under him - as to runing they all run - but all agree that Asahel stood as long as any of them.